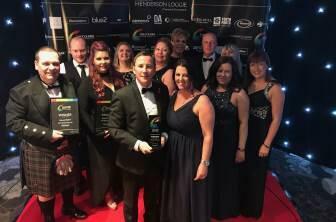 Congratulations to our sister company, McLeod Glaziers, on their recent win at the Courier Business Awards on Saturday 28th October. Some of the McLeods team are pictured with their award for Family Business of the Year, Perthshire Region. This entry was posted in Awards and tagged Courier Business Awards, McLeods.